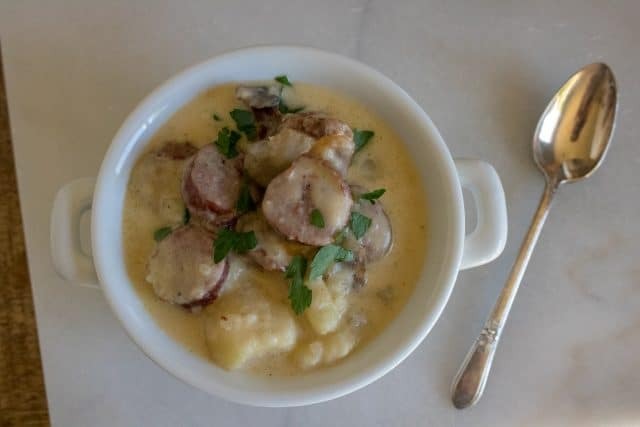 Instant Pot Kielbasa, Mushroom and Potato Soup is creamy, delicious, and tastes like you have been cooking all day! It’s easy to prepare and is ready in a flash thanks to the Instant Pot. 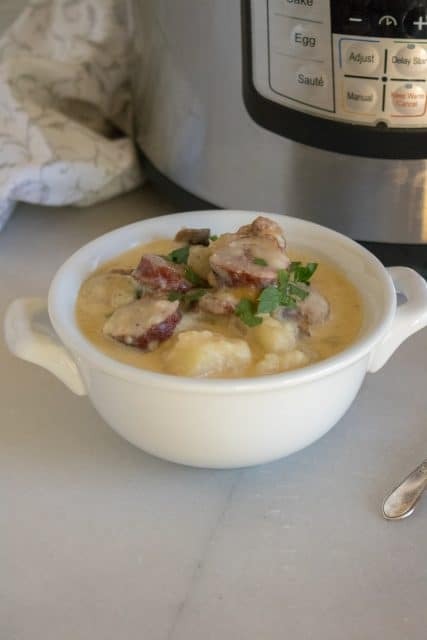 You won’t believe how quickly you can make this Instant Pot Soup recipe! 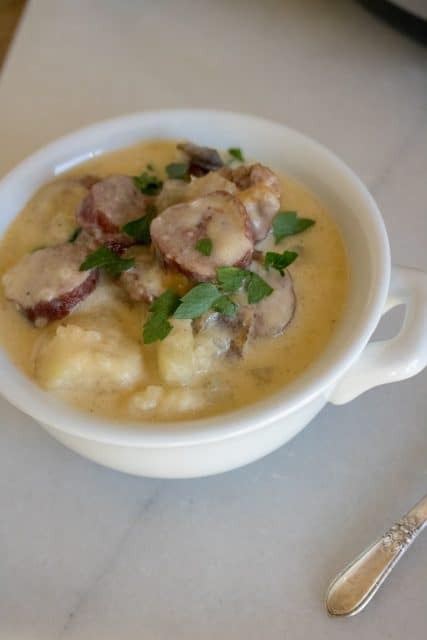 Anytime is the perfect time for Instant Pot Kielbasa, Mushroom and Potato Soup, one of our favorite comfort foods. No canned soup! No draining potatoes for this incredible Instant Pot Kielbasa, Mushroom and Potato Soup! 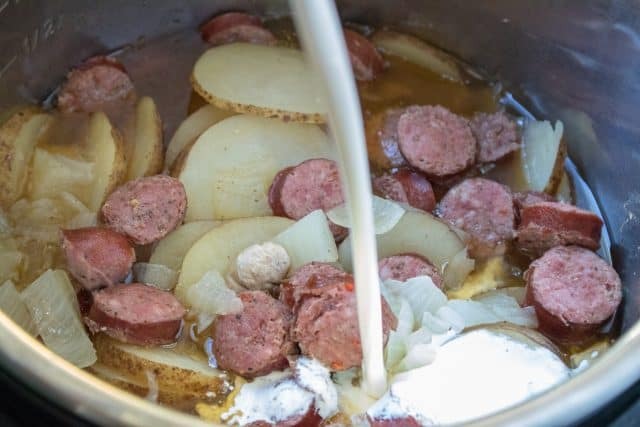 I don’t know where you are, but the night temps have really dropped here in Maine, so I have been craving this soup! 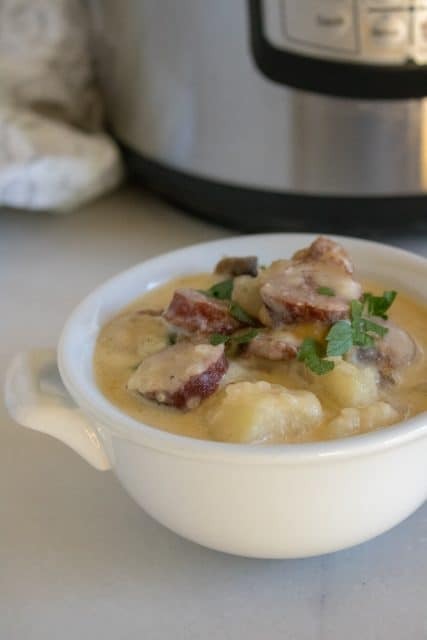 Hubs is a meat and potato kind of guy and just loves this soup, so do my kids, it’s hearty and delicious! 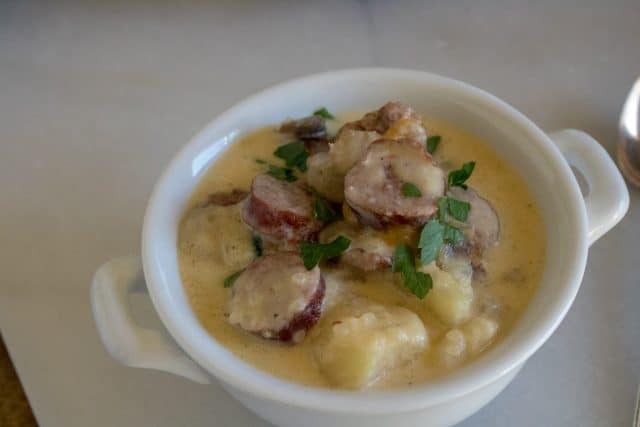 With only a couple basic ingredients you can have this soup on the table really quick! 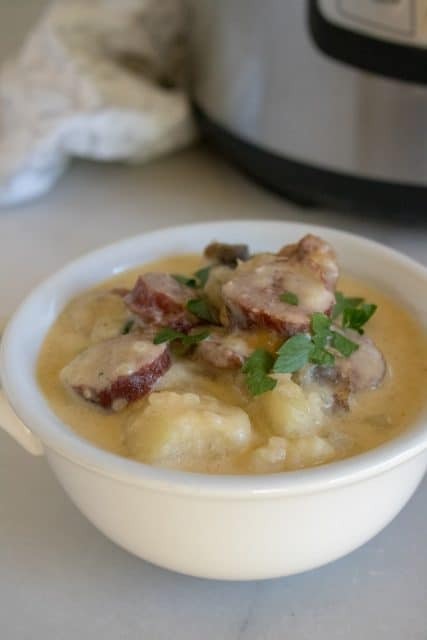 It’s definitely a hearty recipe geared toward cooler weather, but I eat it all year! 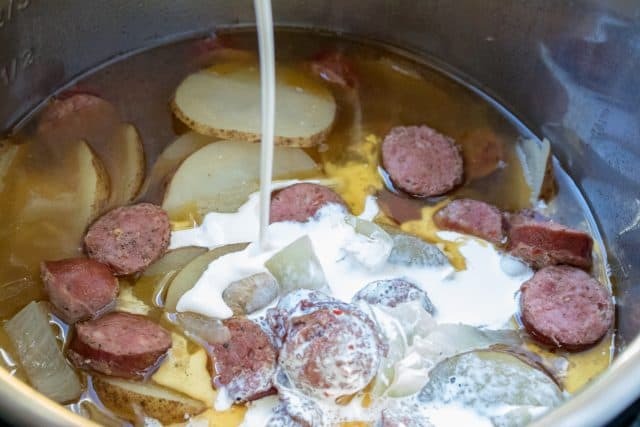 I love the flavors of kielbasa, it really is a delicious addition to this yummy soup! 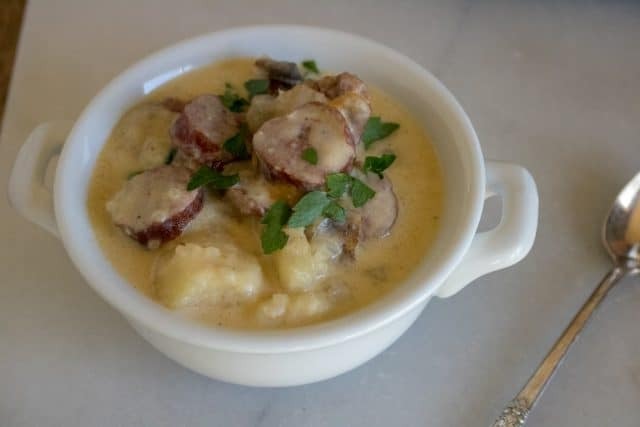 This is definitely a fantastic soup to keep you warm on a cold day! 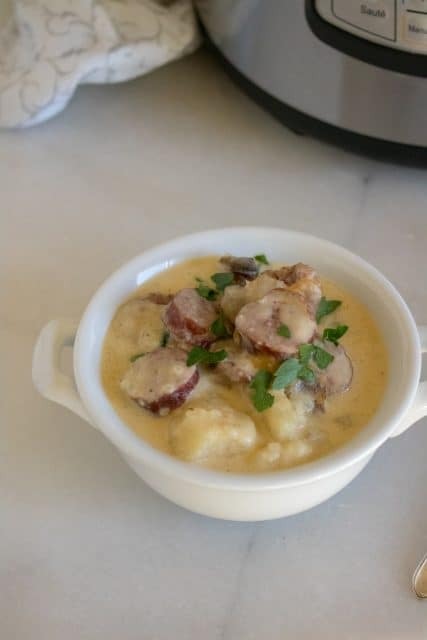 Crazy about potatoes? Me too! 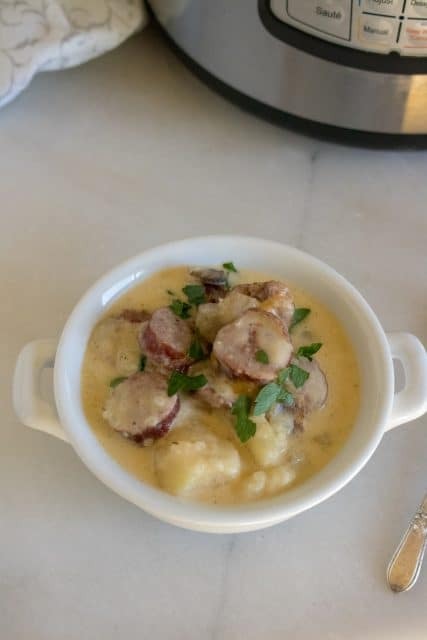 Take a look at my Slow Cooker Mashed Potatoes Recipe! The Instant Pot just made this a quick and easy weeknight meal for us. WINNER! 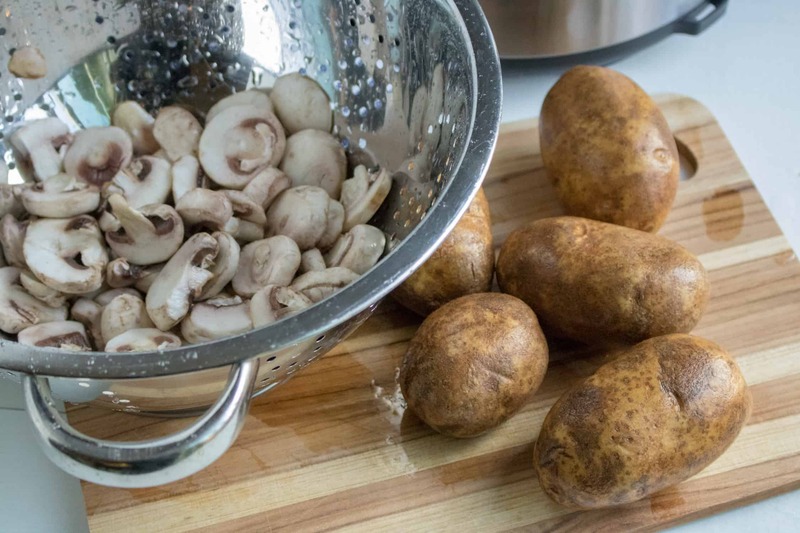 No need to peel the potatoes! Slice Mushrooms. 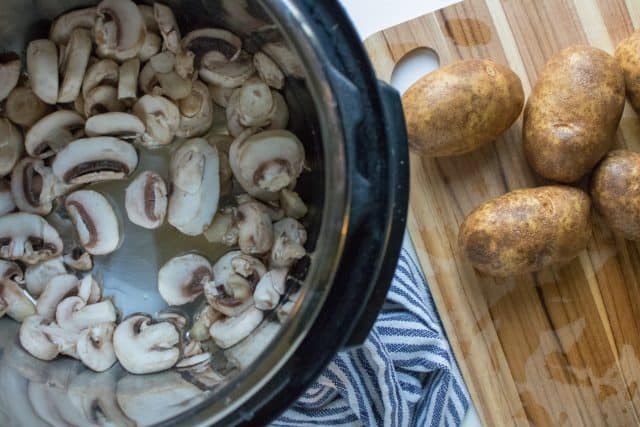 Place them in Instant Pot. 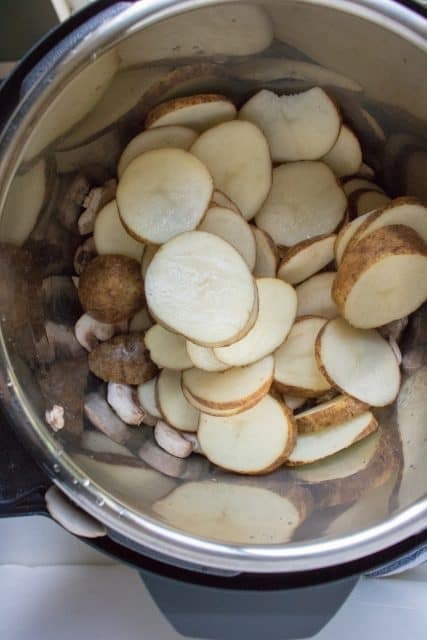 Slice Potatoes. 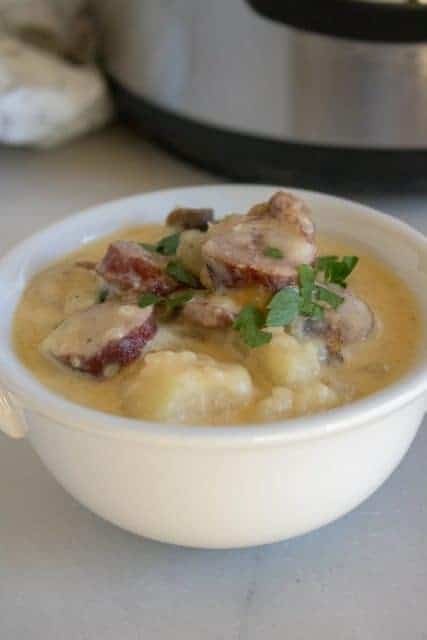 Combine potatoes, mushrooms, sausage, salt, pepper, onion, and chicken stock in the inner pot of the Instant Pot. 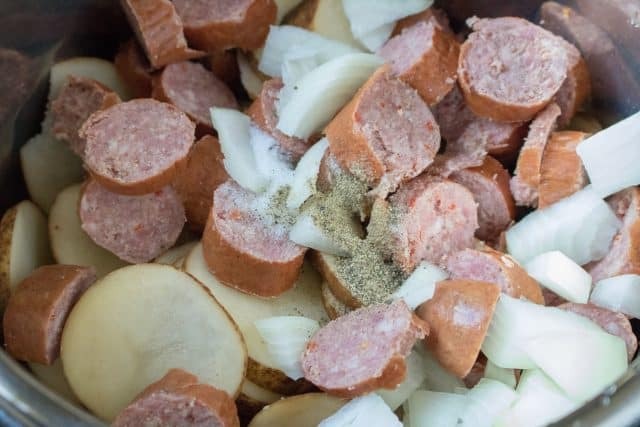 Slice Kielbasa, add to Instant Pot. Add chopped Onion. All kinds of deliciousness going in the pot! 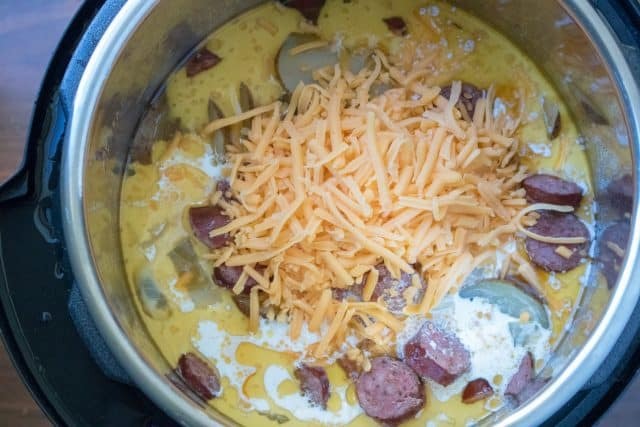 Remove lid and add in heavy cream and cheddar cheese, stirring to combine. Turn pressure cooker onto saute mode and stir until heated. 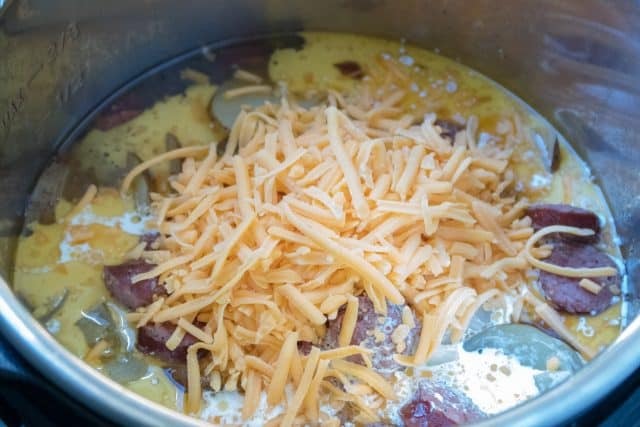 Lots of cheddar cheese for a creamy cheesy soup! All done! That was quick! 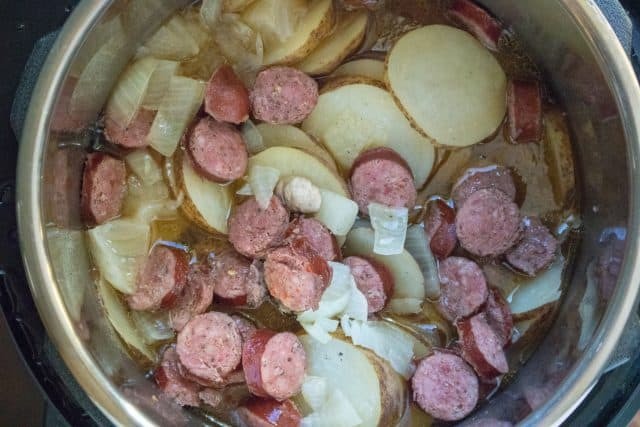 If you don’t have a pressure cooker, you can make this in your slow cooker or stove top as well. 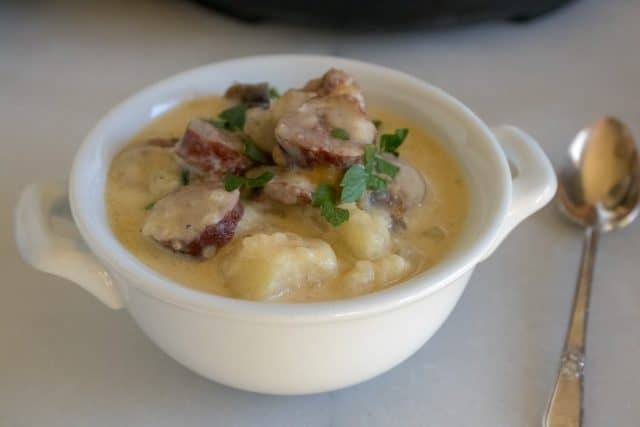 This creamy and warm cheesy potato soup is sure to be a new hit recipe in your house. Not only is it super simple, but also gluten-free. 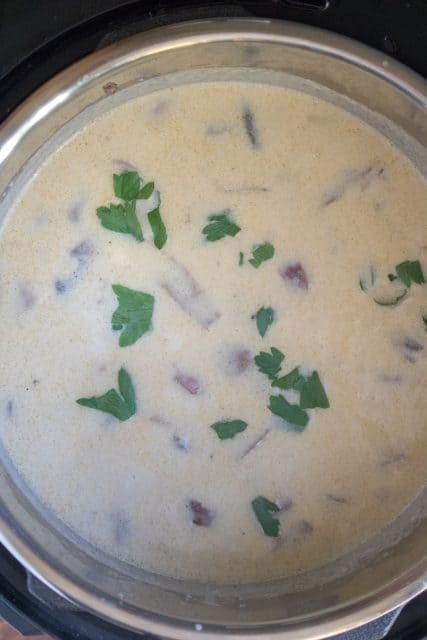 Eat this delicious soup alone, with bread or crackers or pair it with your favorite sandwich. I hope you enjoy one of my favorite family dinner recipes! It’s perfect for a cozy night in and potluck parties for any time of the year! 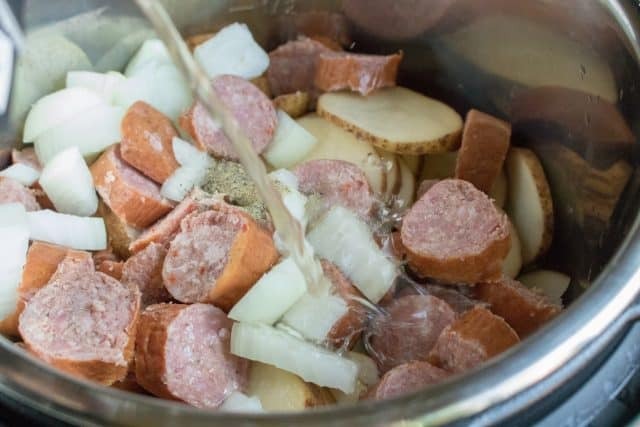 Your neighbors will be wondering, what smells so great?? 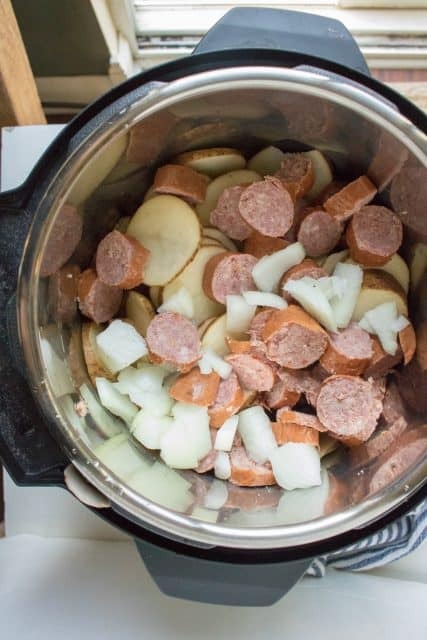 Love all the chunks of sausage and taters! Sprinkle some fresh parsley to make it look fancy! Get ready to dig in! I betcha you will go back for seconds! Serious comfort food coming at ya! I love soup weather!! There won’t be a drop left in that bowl, you will want to lick it clean! Serve with a big hunk of your favorite bread or crackers! 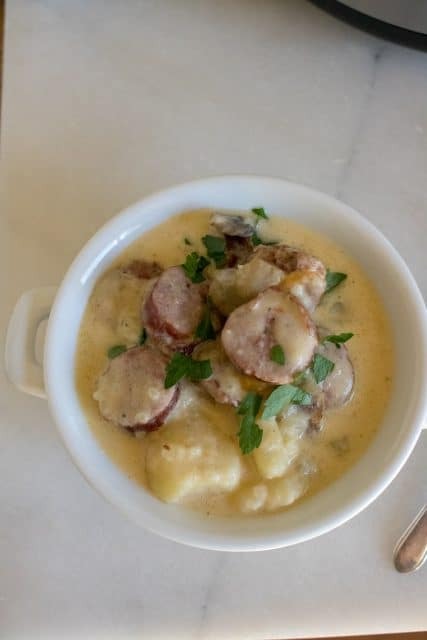 Combine potatoes, mushrooms, sausage, salt, pepper, onion, and chicken stock in the inner pot of the Instant Pot.